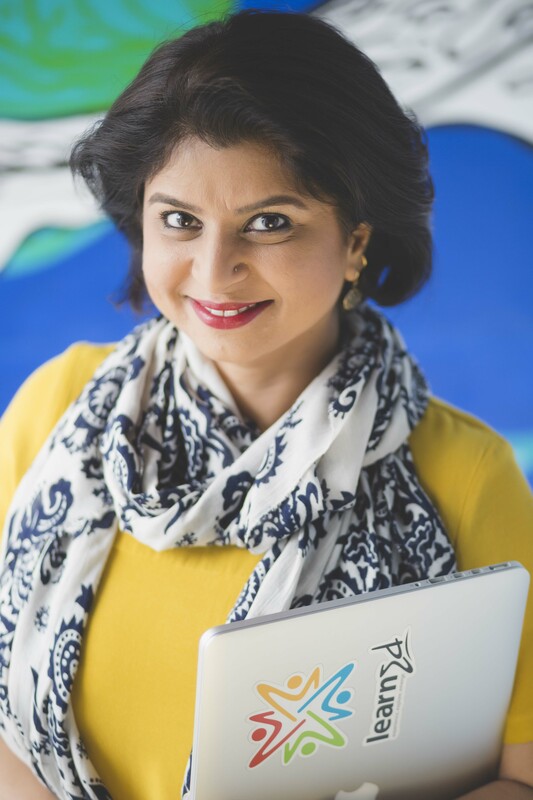 Tarana ​Patel is the​ founder of learnEd, LLC with a base in Los Angeles and an office in Ahmedabad, India. Early career starters and corporate employees are learnEd’s primary audience. learnEd​’s first entrepreneurial effort was an internship program for MATESOL students of The Middlebury Institute of International Studies at Monterey (MIIS), Tarana’s alma mater. More than eight MATESOL candidates interned in India to assist in teaching and developing oral skills courses for engineering, pharmacy, IT, and management students at a rural area college campus in the state of Gujrat. For ​this effort and her vision for learnEd, Tarana was awarded the Young Alumni Achievement Award in 2012 by MIIS. Currently, Tarana is building an app for business English communication for engineers and managers in IT and manufacturing industries. learnEd is currently building an app for business English communication for engineers and managers in IT and manufacturing industries. A prototype of the app is scheduled to launch in Fall 2016. It’s a brand new endeavor for me to synthesize the understanding of on-site training motivators and behaviors in an ESP setting with a gamified design for a mobile learning experience. The goal is to give our learners the practice and help they need—wherever and whenever—beyond their on-site courses. ESPer Robin Sulkosky included the following point in his summary of the TESOL ESP-IS June reading group: “The discussion narrowed to the importance of embedding oneself in a needs analysis, rather than relying exclusively on knowledgeable insiders.” My experience has been in alignment with this understanding. I learned quickly after my initial on-site experience in India that insiders and decision makers do not offer a complete viewpoint of training needs and that learner stories and field observations are an enlightening source of information to inform course design. One of the questions in my needs assessments for on-site training asks potential participants to mark what motivates them to work on their English communication skills. Many commonly known factors such as better job opportunities, promotion at the current job, access to online information, communicating with global counterparts, and so on generally rank higher. India has a family-oriented culture; therefore, I also included the item “to help my children with English homework” as a possible choice. Over 60% of the 150 learners surveyed marked that item as one of their top five motivators. This feedback was an enlightening source of information! I dug deeper through my conversations with my learner groups to further understand what this feedback really meant. Because English is considered to be the language of opportunity in India, they feel most accomplished when they can pass on their learning to their children. We started with this discovery as our motivator as we collaborated to finalize our coursework for that session. Flipped learning and learner training for peer teaching became hot topics in our groups. We drew team building and management parallels with peer teaching and group work and became flipped learning advocates because it allowed family participation. Learners enjoyed watching the TED Talks I assigned in class with family members at home and came prepared to conduct classroom discussions to explore workplace communication principles. Time and budget constraints for ongoing classroom training and the role of mobile devices in our training sessions were simple observations that transformed into an opportunity to build a tech-based solution to assist our learners with their daily communication challenges at work. More than 300 corporate employees have gone through learnEd’s on-site training programs in the past 2 years. In their daily work life, our learners mostly communicate in their local language. They need English to communicate with global partners or to create official documents and presentations. Another important finding for us was that it is challenging for our learners to continue their practice after their on-site training ends. They want a place where they can go to find answers to specific questions about situations in which they need English. They also want to get help for writing high-stakes correspondence, preparing for important presentations, and dealing with negative situations. Breaking down learner feedback to plot their pain relievers and gain creators to further understand their habits and drivers (Osterwalder, Pigneur, Bernarda, & Smith, 2014). So far, our understanding of our learners’ and stakeholders’ needs reflected in program design has created satisfied clients and new business opportunities (Maslow, 1970; Dörnyei, 2008). Check out this blog post Q&A to learn more about learnEd’s app project. After reading Tarana’s inspiring profile above, I am very interested in the types of TED Talks that she assigned because I also use TED Talks in business English and leadership development activities. Do you have any questions for Tarana? Please post those below! Dörnyei, Z. (2008). New ways of motivating foreign language learners: Generating vision. Links, 38 (Winter), 3–4. Friedenberg, J. E., Kennedy, D., Lomperis, A., Martin, W., & Westerfield, K. (2003). Effective practices in workplace language training: Guidelines for providers of workplace English language training services. Alexandria, VA: Teachers of English to Speakers of Other Languages. Osterwalder, A., Pigneur, Y., Bernarda, G., & Smith, A. (2014). Value proposition design: How to create products and services customers want. Hoboken, NJ: John Wiley & Sons. Sykes, J. M., & Reinhardt, J. (2013). Language at play. Digital games in second and foreign language teaching and learning. Upper Saddle River, NJ. Pearson Education. This entry was posted in TESOL Blog and tagged ESP, esp leadership, evergreen, Kevin Knight, leadership communication. Bookmark the permalink. Tarana mentions “discussions to explore workplace communication principles.” These would be aspects of communication that apply in most (perhaps “all”) workplace venues. They are the metaphors and universal pillars of communication: requesting, asking, seeking clarification, retelling, expressing compassion, irritation, anger, happiness, etc. I wonder if there is an article or an actual textbook that might guide instruction in these universal communicative devices–that is, not a course in business communication or other specific area, but a general guide to the expressions, idioms, vocabulary, and language that are necessary in any workplace. A client or student would then need to adjust the communication to a particular field–nursing, banking, business, etc. If anyone knows of such materials, this writer would like to know what they are!